A good starting point for discovering Wallonia on foot is its Escapades brochure (French only). Download it or pick up a copy in a tourist office. Detailing 26 circuits around the region, it’s packed with information on other activities, as well as discount coupons. A highlight is the wild and boggy Hautes Fagnes nature reserve, which extends beyond the province of Liège into Germany. It’s also the highest point of Belgium and is criss-crossed with hundreds of kilometres of signposted walkways. Predominantly flat – though the areas bordering the domain can be hillier – it’s ideal for cyclists, people with reduced mobility and children in buggies. For Sunday and public holiday hikes in Brussels and Wallonia, the Marche Adeps are an excellent, social way of exploring the countryside and keeping fit. Each week, a new set of signposted trails in each province (5, 10, 15 & 20km) is published on the website. Th e departure and fi nishing point (usually a school, village hall or football club) serves as an information point and refreshment bar. 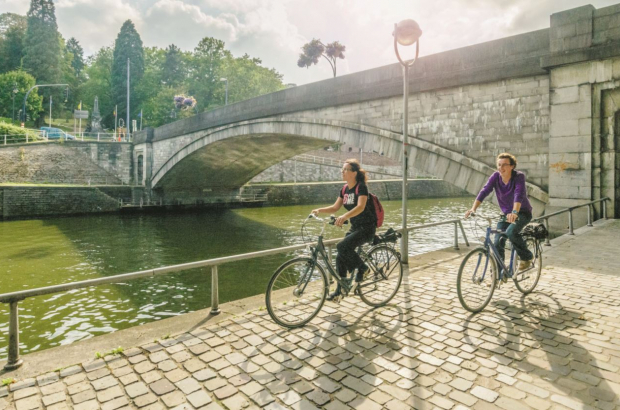 Wallonia is home to a network of 45 cycle circuits, many designed to take advantage of local attractions. They include the Ravel trails: disused railway lines converted for two-wheel use (Namur-JodoigneHoegaarden is one fine example). And of course, trains don’t like steep gradients, so it’s easy riding. Flanders has made walking and cycling across its countryside easy with the wandelknooppunt and fietsknooppunt systems. Log on to either of the websites to create your own walk or ride. The routes are well-marked, with numbered posts keeping you on track, so it’s impossible to get lost. Aside from the obvious health benefits, this is a great way to get to know the region outside the cities. There are also separate signposted walks and cycle routes across the region. Every provincial or town tourist offi ce can give you information and maps. Limburg is particularly rich, billing itself as a cycle paradise. The same is true for the Flemish Ardennes in East Flanders, home to the most gruelling parts of the Tour of Flanders cycle race. The Tour of Flanders Centre in Oudenaarde is home to an exhibition on local pro cycling, a cycle cafe, bike rentals and maps. Belgium’s seaside offers some wonderful opportunities to get moving, with signposted walks up and down the coast. Many of them head inland to paths that criss-cross the dune nature reserves. A charming place to start is the Doornpanne visitor centre near Koksijde. It has maps and organises guided walks and activities for all ages. Should you be looking to join others, there are a couple of groups in Brussels that take to the hinterlands on a regular basis. Expat Hiking Brussels and Brussels Hiking Group do longer and more challenging walks and hikes every week. They can both be found on Meetup.